NWA Focus EMI provides a foundational analytics platform that connects to all existing, disparate manufacturing process data sources and seamlessly accommodates data generated by new Industry 4.0 technologies without having to replicate any of the data. Unlike many other solutions that sit on individual data stores and are applicable to only specific data sources, the NWA Focus EMI global analytics platform accesses data directly from process historians, LIMS, MES, quality information systems and ERP while simultaneously accommodating Industry 4.0 technology additions (ML, AR,VR, AI). By seamlessly integrating any subsequent Industry 4.0 made by a manufacturing organization, NWA Focus EMI accelerates the customer’s return on investment. 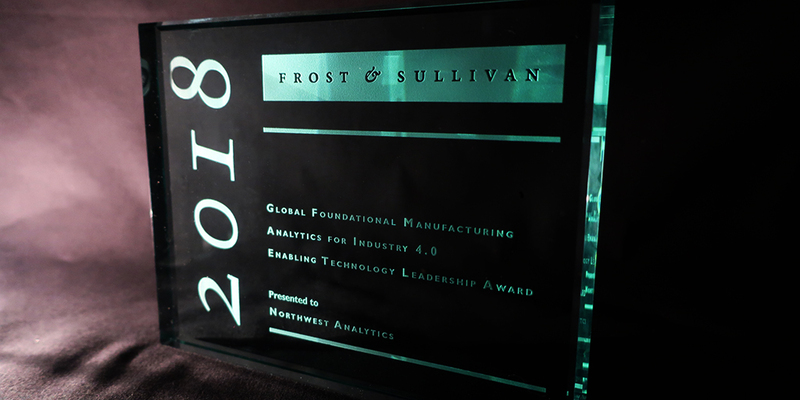 “We’re honored to be recognized by Frost & Sullivan for this prestigious award as it underscores our commitment to accelerating and transforming the manufacturing and process industries to provide a gateway to Industry 4.0,” said Bob Ward, Northwest Analytics Chief Executive Officer. “In fact, we recently announced an enterprise license agreement with The Dow Chemical Company. Currently, with more than 170 implementations of NWA Focus EMI at Dow Chemical plants, this agreement will further enable the global roll-out of NWA Focus EMI to support Dow Chemical’s Industry 4.0 digital enterprise vision,” he added. NWA Focus EMI enables role-based decision support, turning data into action to lower costs, increase yields and improve supply-chain control. When the processes running in a manufacturing environment have been controlled through NWA Focus EMI’s foundational analytics, other analytics solutions are able to pick up more nuanced, faint signals out of the data in a more efficient manner. The foundational analytics approaches delivered by the NWA Focus EMI platform are easily applied across the process environment, even by users who do not have specialized analytics knowledge. The easy-to-use, intuitive design of NWA Focus EMI appeals to users across all levels of the organization – from operators and process engineers to directors – and requires minimal input from IT resources during installation and maintenance. "Yet another differentiating feature of the NWA Focus EMI is its KnowledgeBase functional module, which automatically captures and organizes a range of proven manufacturing best practices and process solutions," noted Sankara Narayanan, Senior Industry Analyst. "Overall, the foundational analytics of NWA Focus EMI are a simple, customer-focused solution that provide most of the benefits manufacturers desire." Northwest Analytics is a leading provider of Industry 4.0 manufacturing analytics solutions for manufacturers, delivering process decision guidance into 35% of the Forbes 1000 manufacturers and more than 3,000 manufacturing customers worldwide. Northwest Analytics is focused exclusively on enabling better operational visibility and analytics-based decision making for manufacturers, providing a powerful, easy-to-use suite of manufacturing analytics solutions that emphasize enterprise-wide integration and scalability. NWA is the partner-of-choice when it comes to helping its customers increase operating efficiencies and throughput, while delivering a fast and effective ROI. For more information, visit www.nwasoft.com. Frost and Sullivan in partnership with Northwest Analytics, The Dow Chemical Company, and Albemarle Corporation are hosting a webinar, Enable Industry 4.0 Success with Analytics, on Wednesday, September 19, 2018 at 9AM CST. Join us as three industry thought leaders discuss the application of manufacturing analytics to enable Industy 4.0 success. Register today!